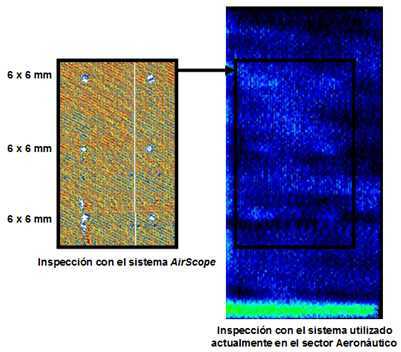 1 AirScope: Non-Contact ultrasound inspections. - Water can flow into the component structure, especially in CFRP, laminates and mask the presence of some flaws like delaminations. - Components inspected by water coupling usually have to be dry and cleaned afterwards, increasing production time. o Hydrophilic materials like non-cured composites. - The huge impedance mismatch between air and any solid material introduces large insertion losses, which usually generate signals with poor SNR. Airscope transducers and electronics have been designed to maximize emission efficiency and reception sensitivity, providing the best possible SNR in most challenging scenarios. - Pulse-echo inspection is virtually impossible because the large reflection coefficient (99.6%) generates a large interface echo that mast any defect inside the component. That is the reason why non-contact inspections are performed in through-transmission mode from both sides of the component. On the other hand, the large velocity mismatch between air and solids generates strong refraction, and the critical angle for longitudinal waves is rather low (about 6º for CFRP) making alignment between transducers critical. High precision of AirScope mechanics warranties a total control of incidence angle, minimizing signal loss due to transducer misalignment. - Increasing frequency increases attenuation in air. Although it is possible to manufacture transducer with -20dB sensitivity at 250 kHz, it is quite difficult to achieve -40 dB sensitivity at 1 MHz. Airscope transducers manufacturing technique allows focusing the beam at the component surface, maximizing the transmitted energy, sensitivity and resolution. 2 Inspection of honeycomb material. Different from CFRP monolithic components, honeycomb structures must usually be sealed when inspected by water coupling, to avoid water to flow into the part. Airscope system allows inspecting this kind of parts without contact, maintaining the core integrity without sealing the component edges. Defects that can be detected include: delaminations, inclusions, crushed core, lack of adhesive, unbound, etc. - Aluminum core and 3 layer CFRP skins. 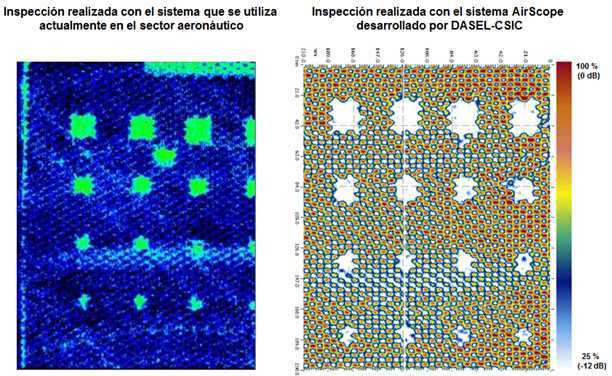 Figures 3 and 4 compare the results obtained with Airscope (right) with those obtained with a standard non-contact system currently used in aerospace industry (left). Higher resolution and contrast of AirScope system is evident. Fig. 3.- Results of the inspection of the ¼’’ core zone of the PRB-01 test sample. (left) with the standard system used in aerospace industry and (right) wit Airscope solution. Fig. 4.- Results of the inspection of the 1/8’’ core zone of the PRB-01 test sample. (left) with the standard system used in aerospace industry and (right) wit Airscope solution. - Honeycomb structure with aluminum core and 4 layer CFRP skins. Fig. 6.- Defects location of PRB-02 test sample. 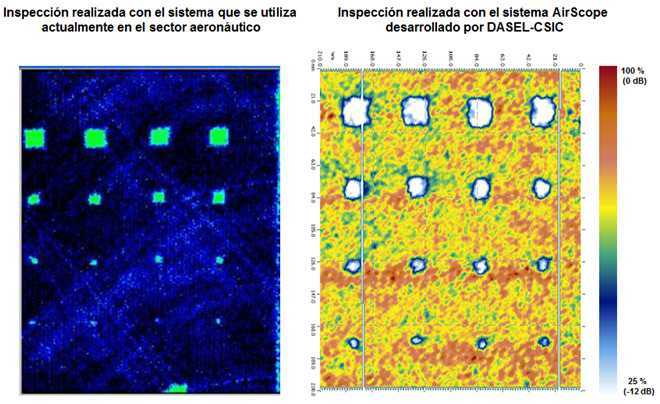 Figures 7 and 8 compare the results obtained with Airscope (right) with those obtained with a standard non-contact system currently used in aerospace industry (left). Higher resolution and contrast of AirScope system is again evident. Fig. 7.- Results of the inspection of the 3/16’’ core zone of the PRB-02 test sample. 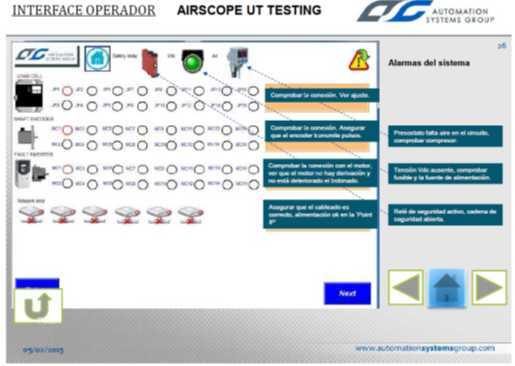 (left) with the standard system used in aerospace industry and (right) wit Airscope solution. Fig. 8.- Results of the inspection of the 1/8’’ core zone of the PRB-02 test sample. (left) with the standard system used in aerospace industry and (right) wit Airscope solution. 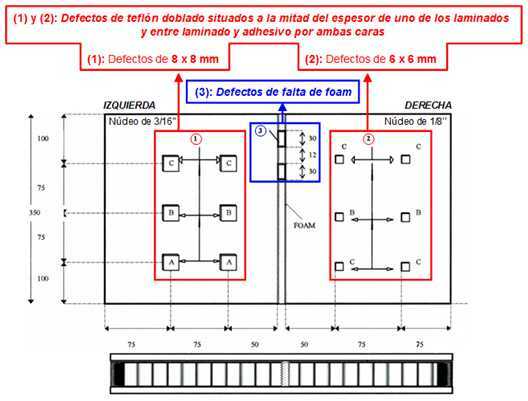 - In the left side of the PRB-01 test block an indication appear with the conventional system and not with Airscope. This indication is from a sticker that was removed between inspections. Furthermore, the indication in the top right of the image does not appear because scanning area was smaller with Airscope. 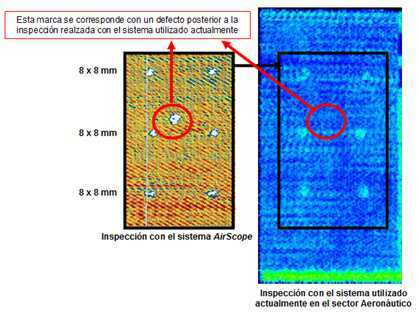 - The inspection of the 1/8’’ core side of PRB-01 evidences the higher resolution of the Airscope system. 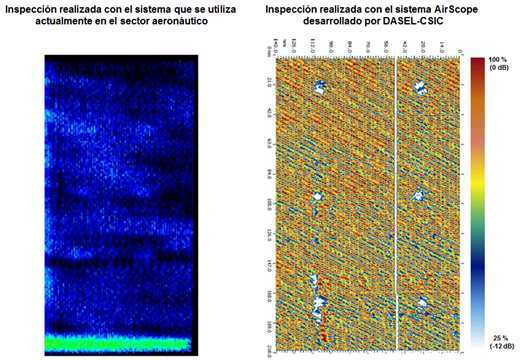 Smaller defects (6x6 mm) are clearly detected with a -12dB threshold, while with the conventional system are detected only marginally (Fig. 10). Fig. 10.- PRB-01, core 1/8’’ : Resolution differences for the smaller defects of 6x6 mm (left) Airscope and (right) conventional system. - In the 3/16’’ core zone of the PRB-02 test sample, higher resolution and contrast of Airscope system is also evident. 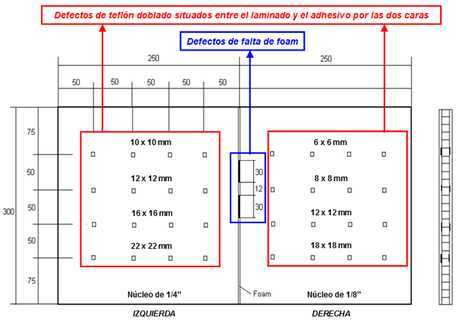 An indication that is not present with the conventional system was due to a surface impact performed between inspections. Fig. 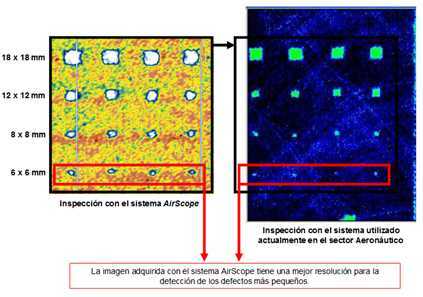 11.- PRB-02 core 3/16’’ Comparison of resolution and contrast between inspections (left) Airscope and (right) conventional system. - Inspection of the 1/8’’ zone of the PRB-02 test sample reveals the higher contrast of the Airscope system, detecting six defects that are hardly seen with the conventional system. Fig. 12.- PRB-02 core 1/8’’ Comparison of resolution and contrast between inspections (left) Airscope and (right) conventional system. 3 Main features of Airscope Systems. Its reduced dimensions (50 x 100 x 170 mm) and weight allows mounting the Airscope system directly on the inspection head, avoiding noise problems associated with long wires. Its Ethernet connection eases integration into the plant communication infrastructure. 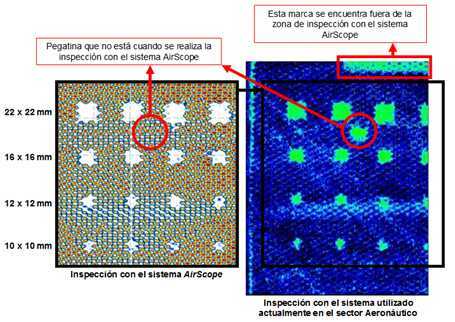 Airscope is the unique non-contact multi-channel system in the market that, depending on the number of active channels, allows increasing the inspection speed up to 8 times. Inspection speed for a single-channel configuration is 500 mm/s with a resolution of 2mm. SonoJet focused transducers, included with Airscope systems, have been specifically designed by the Spanish National Research Council (CSIC) for air-borne ultrasound applications. Fig. 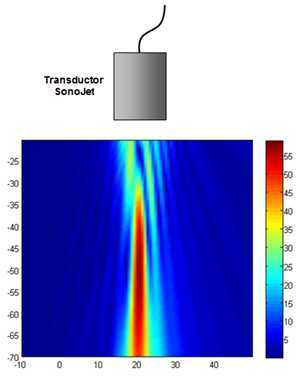 13.- Field simulation of the focused SonoJet transducers. 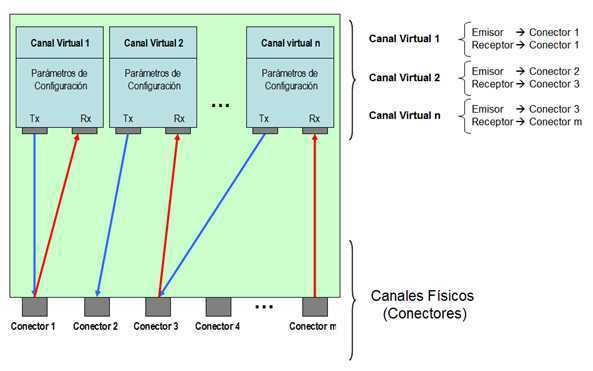 Virtual channels are defined by assigning a connector number for emission and another for reception. A virtual channel can then emit and receive from the same connector (pulse-echo) or with different ones (pitch-catch or through-transmission). Physical connectors can be shared among virtual channels. Operation parameters are independent for each one of the 32 virtual channels (pulse width, gain, filters, averaging, etc). 3. With EMI filter or averaging à 20.480 samples independently of the sampling frequency. Programmable up to 26 ms, with 100 ns resolution. Programmable from 100 ns y 25.6 us, with 100 ns steps. Anti-aliasing low-pass filter at 2.5 MHz (Bandwidth (-3 dB): 20 KHz to 2.5 MHz). Post-processing functions of the traces in real time. 64 tap digital pass-band FIR filter, with arbitrary low-pass and high-pass frequencies. - Constant answer in the filter pass-band (ripple < 0.1 dB). - High attenuation out of the filter pass-band (typ. > -50 dB). Information registry in real time: A-scan, gates, peaks, encoders position. Programmable traces compression: ratios from 1:1 (no compression) to 128:1, without loss of information in peak amplitude and position. Programmable decimation from 1 to 4095 (equivalent to sampling frequencies from 24.42 kHz to 100 MHz). Digital envelope detection (VIDEO output) by 64 taps Hilbert filter and CORDIC processor. - Eliminates, in real time, impulsive noise. - Improves defect detection and reduce false positive indications. - Allow a large dynamic range in C/D Scan images in noisy environments. 7 W máx = 1100 mA (6 V), load 50 W, PRF=5 KHz, pulse amplitude -400 V.
Ethernet 100 Mbit/s. Connection with TCP/IP y UDP/IP. - Simultaneous acquisition of several C/D Scans. - A-Scan registry in C and D scans, with post processing capabilities like gate position change. Whole data cube available for analysis. - Registry of encoder position and gates peaks during C and D scans. - Evaluation of signal-to-noise ratio in C-Scan images. Our inspection gantry system is based on a flexible structure that easily adapts to different dimensions, upon client requirement. It is based of a solid structure with pre-mounted and electrowelded frame, with a high quality primer coat and oven-enamelled paint to avoid corrosion. It includes fixing points with levelers, with no need of specific ground foundation. 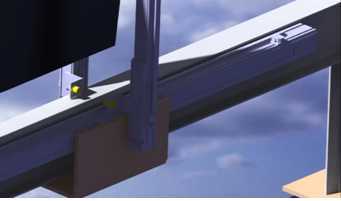 Its vertical configuration allows installing it in zones with restricted access, near vertical bulkheads, because access is required from one side only. Its flexible architecture allows easily adapting the system to future client needs. 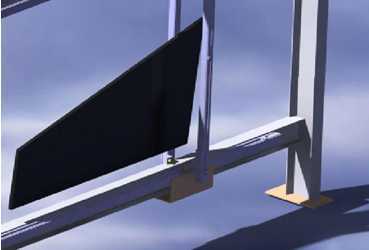 Based on a solid structure, it can reach a size of 4x3 m, while it can be dimensioned for small systems down to 0.5 x 1m. Regardless its dimension, the system is designed to easily perform inspections of components of different size and shape. It includes a frame holder with a longitudinal slot that allows easily loading different frames that hold the inspected part. This gives a high degree of flexibility, allowing the client to control the component fixation process in an easy and secure way. Once loaded and fixed, the inspection can be done automatically of manually, allowing the operator to move the inspection head in any direction using a button panel, choosing the movement direction and speed. Also manual movements are motorized and monitored by encoders, so manual inspections can be registered. 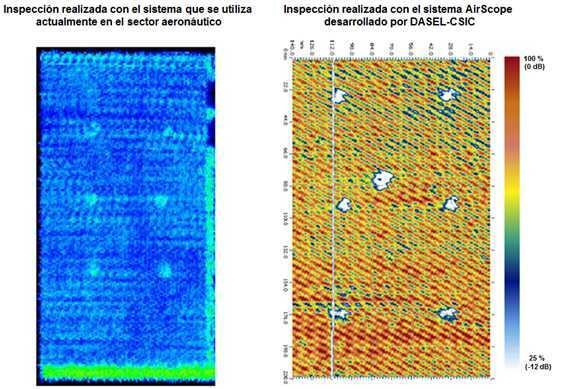 Fully automated inspections are also possible by programming scanning trajectories for each component model. 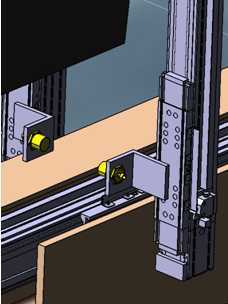 Gantry robustness and flexibility of the frame-holder system is completed with a kinematic group made of synchronized and high precision linear guides with silent transmission. Main features of the kinematic group are inspection speed up to 1 m/s and acceleration up to 10 m/s2. Repeatability is warranted by the high system capacity, which can handle dynamic loads above Cx 1.715 N and Cy 1.000 N, and dynamic moments of Mx 22 Nm and My 31 Nm, withstanding inertia and stress caused by the inspection head displacement. System is driven by electrical motors with closed loop control with encoders, based on Ethernet communications. Combined precision of the control system and the kinematic group is of 0.1 mm of maximum deviation in any axe. Repeatability is 0.2 mm maximum into the holding frame. 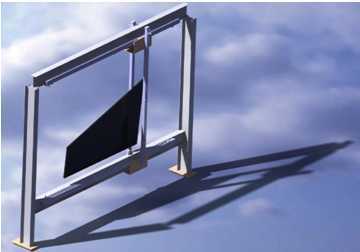 Gantry is controlled by an intuitive graphical used interface in a touch-screen panel. It incorporates status information and an advanced support and maintenance help system.